The “Platz Da!” initiative has officially launched, as reported in the Weserkurier and on the telly. “Platz Da! 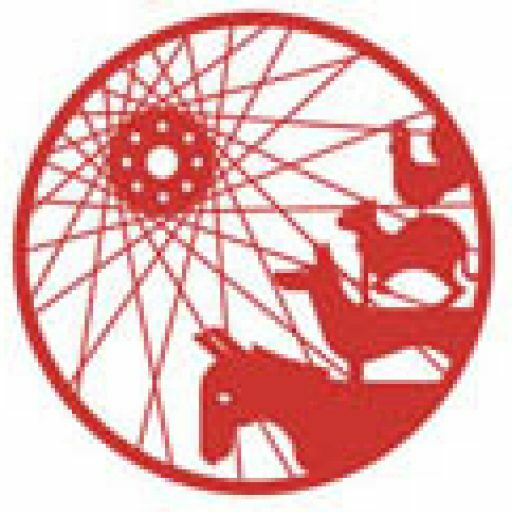 Bremen “is involving a growing number of Bremen citizens who are working together for a better cycling and walking infrastructure, and a comprehensive parking management system for the city. 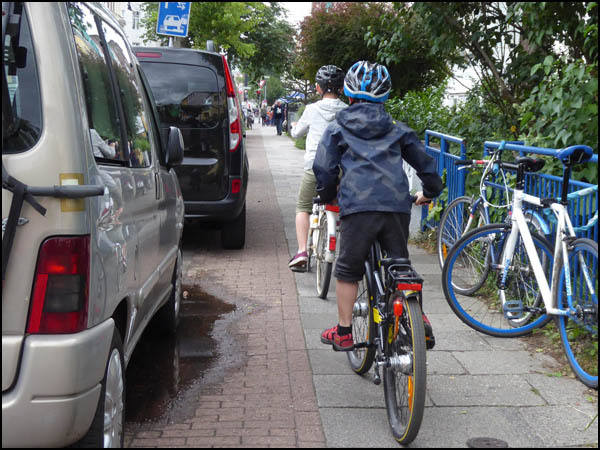 The campaign’s key demand is that the streets belong to all of us, not just the owners of parked cars, and is working with the Transport Transition Alliance , launched in January 2018 with a call for a city-wide management of car parking, and a genuine strategy for reducing space used by parked vehicles. Following a television documentary about the “do it yourself” and bicycle culture in Portland, Oregon, last year, many Bremers, and especially cyclists, asked me if Portland is really as cool as all the hype. 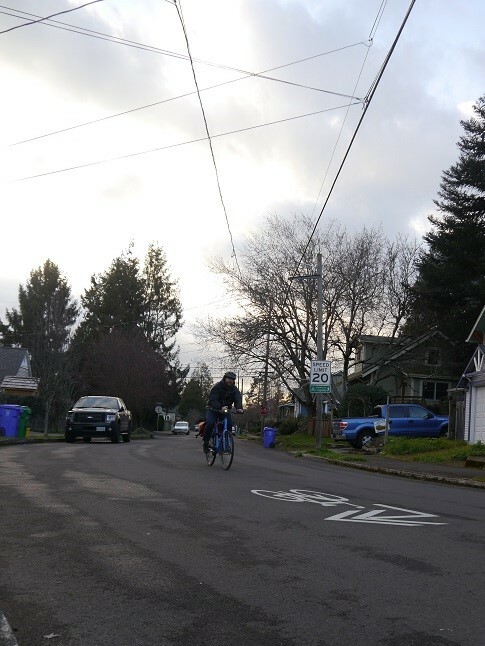 Well-signed bike route through residential streets in the Mt Tabor neighbourhood of Portland, Oregon. Sunday night on the way home from the swimming pool my 8 year old daughter and I were almost run over by a car turning left into the crosswalk where we were (legally!) 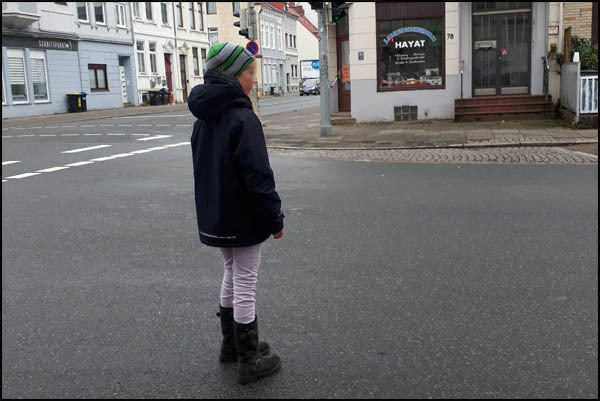 crossing the street. Unfortunately we experience similar situations several times a week, since traffic enforcement in Bremen is dying out, and frustrated car drivers take their aggression out on the “weak.” This incident occurred at the intersection of Kirchweg and Kornstrasse in the Neustadt, just seconds away from our front door. In the school cafeteria at Leibnizplatz, Schulstraße 24, 28199 Bremen. 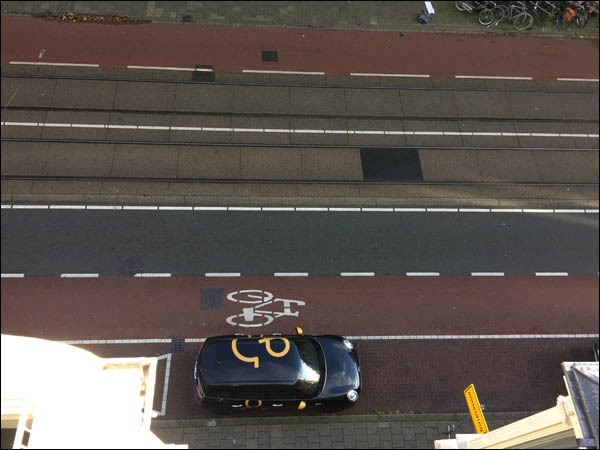 Bremen Cycle Streets: Humboldtstraße – A Role Model? 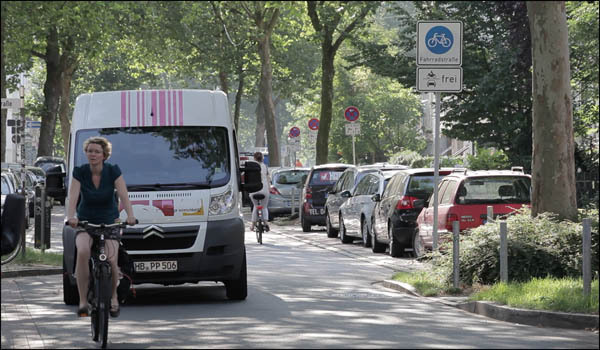 Bremen’s politicians are extremely proud of the new design of Humboldtstraße as a Cycle Street. It is hailed by our representatives and their cycling advisers as a great solution for a range of problems. However, the new design didn’t arise because all the experts thought Humboldtstraße to be the ideal space for a Cycle Street. Rather, the idea was developed because Hansewasser, Bremen’s water company, planned to upgrade the sewer system under the road. What a nice and friendly way to get into contact with people!